It’s also no coincidence that some of the most famous quotes throughout history are structured in three parts, nor is it surprising that the Rule of Three also works wonders in the world of comedy. What the Three Little Pigs, the Three Blind Mice, Goldilocks and the Three Bears, the Three Musketeers, the Three Wise Men, and the Three Stooges have in common? 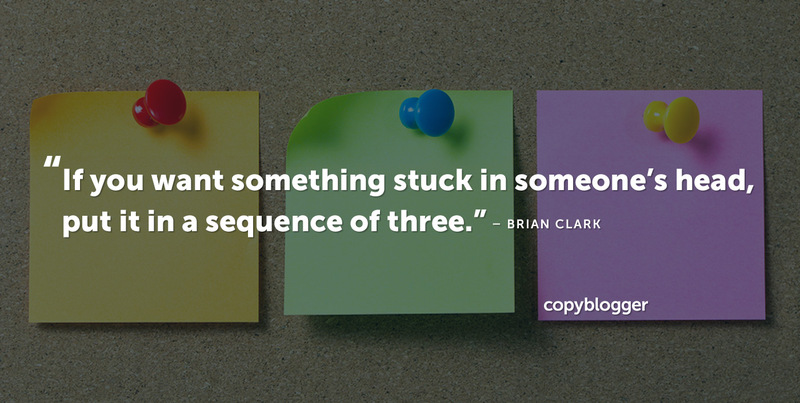 Think in terms of three when crafting your content and you’ll likely end up with a more engaging outcome. If at first you don’t succeed, remember: the third time’s the charm. You see the Rule of Three used all the time across diverse areas of life. Because information presented in groups of three sticks in our heads better than other clusters of items. The Rule of Three fits the classic joke structure of set-up, anticipation, and punchline. The three-part grouping also allows for tension to build and then be released thanks to the surprise and absurdity contained in the third element. Here are a couple of humorous examples that use a shocking third element within the Rule of Three structure. Using humor in your writing can be risky since some people just won’t get it, but using a Rule of Three approach is a safer way to make a funny. Professional comedians use it all the time, and that’s simply because it works. It’s the “…list posts with three items…” that I’m looking to grasp a bit better. Yeah, that’s what I meant. People will tell you that 7 is the ideal list length now, but I’ve had a lot of luck with three-item list articles too. Great post buddy- it spoke to be through the practical use that 3 is better than four and so on- i didn’t really think about it but you hear it for years at least in church I do- the three points. Instead of two or four. More than three and i’m lost. Beginning, Middle, Ending. Thanks for the reminder. Triangles… Stools, cheerleaders’ pyramids, and bridges. Solid effective balance. And really great compositional dynamics. Three primary colors. Small, medium and large forms. Point, line,and plane . All essentials to making good art. Just read Kandinsky. It is so very exciting for me, a painter, to find these rules of three work across disciplines. As always you are brilliant, effective and timely. This got me trying to figure out why? and it is so obvious that I never saw it before. There is only one shape that can be made with three lines once you have determined their length….a triangle (only mirror images or rotated images based on how you chose the pieces). As the number of lines grows beyond 3, the shape of the images can change based on the sequence in which the pieces are chosen. Thus three is easy to remember and relate to because it is a constant. That is why a triumvirate of power tends to be stable. Now most readers will think I’m a nut but I get it…. Cool concept and one that I’ve found showing up in my own work without thinking. Blog posts cover three topics always sound best to me. They’re short, sweet and pack a punch. I will definitely keep the rule of three in mind when writing…sounds like it will keep me on the straight and narrow. I’ve never realized this rule in humor… It’s amazing! Great things in every single article! I wonder how much it takes to write such article… Congratulations! Yes the handy rule of three – always a winner when picture-making. How Copyblogger became the pre-eminent copywriting tips blog. Brian, great as usual. But I don’t have anything to say about the article itself. I’m just surprised that somebody else out there knows who Laura Kightlinger is. As a young PR account executive, I was taught the rule of three for effective presentations. It’s a simple but powerful way to help people to retain the main points of any presentation. Probably more useful in training young PR account execs, its a good way to ensure the presenter has a clear point to make! So tell ’em what you’re going to tell ’em; tell ’em; tell ’em what you told them. Rather than sounding repetetive, use some of Brian’s many refinements to reinforce the message and add interest. Great post Brian. An extensive study on somem popular fairy tales did conclude that number 3 has been repeatedly used. It has Spiritual as well as sexual connotation. Good to see how this number can be effective in writing. An insightful post indeed. Hi Brian, I really like your site. Its very informative. Just one question — How does one actually start a blog? Is there software or something? I think that any idiocy on my part before 9am and three cups of coffee should be completely overlooked and erased from the tomes of history. I guess that’s why I use three adjectives when describing a noun? 3 is a lucky number! This is a great article because if you print it out and cut out each line and line them up and do a 45 degree angle at each point that expresses a double possitive, it creates a triangle. 3 sides. I knew 3 was a good number, but you just went out and proved it. I was wondering – are 5 and 10 in any way comparable, because people use “Top 5” and “Top 10” lists a lot. It would be interesting to compare which is most effective. I can’t argue with you…it’s an excellent point! One thing I’ve been taking more notice of and trying to implement is blogging in series. Write a post but leave them with a cliffhanger. Lol. Make it a 3 part series! Excellent article, Brian. I have no idea how I’ve never thought about or recognized the Rule of 3 before (at least, not on a conscious level). Very simple, yet incredibly effective. I probably already employ this in my writing, without even realizing it. But, now, I’ll be making a more conscious effort to make use of it. I went out and start hunting on things that obeyed the rule of 3. Some of the things that came to my mind: new picture frames with 3 photos, hotel decor arrangements, movie trilogies (LOTR, Matrix)! like your insight on 3 is the minimum number of creating a pattern. I also find 1-2-3 step process more appealing and friendly. I’ve often though that the reason odd numbers work better is that they create dissonance and therefore force more interest. Even numbers connote stability and balance and make us feel more peaceful – not what you’re looking for when you’re looking to engage your prospect/customer. The number three is truly fascinating! I love how you’ve explained the concept with so many fun-to-read examples. And I’m liking some of the theories in the comments here, lol. The rule of three is also very big in photography — look up the “rule of thirds”. A photo is often much more interesting when it’s broken up into thirds rather than halves. Kinda funny. I was checking out many magazine headlines and behold there were tons that use the rule of 3. Here are a few examples. One from Mens Health: New Year, New Body, New Life. This is a great post. Thank you. I knew bits and pieces from experience regarding the use of 3 throughout time, but you did a great job of pulling it all together. I felt kind of good because I am just finishing up a 3-part post. Excellent Article. Makes a lot of sense. No fair Brian. I wrote about the rule of three over a year ago. It works and I think that the 3 is a good basis for adding more depth and layers in writing. It isn’t the only method for writing structure but it is one that works. 3 is the real formula. We teach the children when telling a story: start at the beginning, then there is the middle and finally the ending. How soon we forget. You are so right. Keeping it simple is the way forward. So basic…yet it totally makes sense! Another place the number three turns up is in the “Rule of Threes” that is taught by survival experts. By learning (and applying) the “Rule of Threes” your chances of surviving a life-threatening situation go up. A lot! I have used the “Rule of Threes” as the inspiration for my “ISV Survival” blog (http://isvsurvival.com/blog/) where I cover the life-threatening challenges that independent software vendors (ISVs) face in the shift to Software as a Service (SaaS). Sadly there is a downside to this rule of three. When you think about the way organizations use taglines the recent trend is to find three descriptive words, plop some periods between ’em, and call it done. Sure it is comfortable. And it might even sound memorable… but the only thing memorable about it is that there are three words, not what those three words stand for. Just one thought from a guy that writes names and taglines for a living. This makes total sense. There is a rule in proposal development that works without fail. In reading a detailed proposal, the brain naturally picks up the first line of a list, then jumps to the last, so classically, put the most important point in the 1 position, the 2nd most important point last. Then, it seems, the eye jumps to the 2 position, then next to last, then back up to the 3rd position. A pattern, until the eye and brain give up. So to make a more solid proposal, make only 3 points, that way, the reader can more effectively scan, reading point 1, 3, and 2, and then free to move to the next subject. Guaranteed to expedite the review, and probably increase success in marketing. What a truly enlightening post. Classical music symphonies are in three movements / fast-slow-fast. We juggle three balls. The waltz (most graceful for couples) is written in three beats per measure. I Ching is composed of trigrams. Japanese gardens use three rocks not four. The triangle is a sound structure, like a roof. Catholics have their holy trinity. And when ya “rack em up” to play pool you use a triangle. Thanks for this concise, educational, and interesting explanation. I’ve noticed in my own writing I am drawn to three examples of most things. It’s nice to know it’s not a personal foible, but an ingrained part of our brains. This also carries over into graphics where there is also a “rule of thirds”. I’m wondering if anyone got the Monty Python and the Holy Grail reference…. I love this rule. It’s funny, it’s engaging – and it totally works. You know what I’m gonna do with this rule? I’m gonna read it, think about it a moment, and then disregard it entirely. That’s right Jeff, ignore everyone that knows more than you do and is trying to help you. That’s why you’re not a successful writer or graphics designer. Don’t bother thinking about it, you’ve obviously given up thinking a long time ago. Great observation. I’ve noticed when I write articles and I want to give examples or a series I’ll write the intro . . . use a colon: blank; blank; and blank. READY . . . AIM . . . FIRE! Thanks Brian, for another action-provoking post. Incidentally, Churchill never referred to “Blood, sweat and tears”. This is great and makes a lot of sense. The number 3 is also used in Boy Scouts, many eastern religions (as well as the trinity) and I think there is merit in it. Any numerology people want to comment? I like the number 3 and often find myself using it in my article writing. but mathematically, “three is the smallest number of elements required to create a pattern” is incorrect; that would be two. Just ask any binary number. but two is boring, and not nearly as memorable as three! A cord of three strands is not easily broken…..
i know its old, but Lol @Jeff . @james u DON’T get it do you!!! Now we need an article on how to effectively use punctuations, emoticons, etc. Yeah Andrew, I get it. Obviously, you don’t have a clue. You are basically a moron with no understanding of anything. Who ties your shoes for you? Mommy still does it? Why an article on punctuation? You wouldn’t understand it anyway. The thread of the original topic has been going on for a few years now. Every so often I get an email with a new entry. Some more interesting than others. But, adult civility was kept intact. Come on folks. Give it a rest or exchange email addresses. Take this to the back alley where it belongs. This was the first time I have read your blog WOW, you got me. this kind of insight stirs my mind.I shall be a regular visitor from now on. Well, Lionel said she was three times a lady. GMC talked about the Rule of Three in their commercials. I like this. I often use three in articles because you can dive in a little deeper without creating an extremely long post. I am an artist. The rule of three being esthetically appealing is very effective. I use a lot of artificial flowers and if I try to put 2 or 4 items, flowers or otherwise, on a piece of my artwork, it just won’t look right. There’s a balance to it. Isn’t that interesting that it’s also true of writing? And as a blogger, the preference for paragraph length is three sentences. That’s not a hard and fast rule, but it certainly is a guideline worth following, as often as possible. Great post. Always looking to improve my blog writing and there are some really good tips here. Thanks! It was a perfect timing to come across your post today. I was reminded to go back to the basics, to set priorities and then narrow them down and rank them A, B, C. Simple process and it helped me to get re-focused.